While the major players in the Second World War have received ample coverage in publications, there were quite a few other nations involved (it wasn't called a world war for nothing, after all). One of those nations was Bulgaria, and its air force during the 1940s was an interesting one. A blend of aircraft from Czechoslovakia, France, Germany, and Poland, along with a handful of indigenous designs, made for a highly varied air force, one which is starting to be covered in publications. This book by Kagero attempts to provide a solid overview of the Bulgarian Air Force, from the 1930s through to the end of the Second World War, providing a very useful overview of this fascinating air force. The book begins with a short history of Bulgaria during the Second World War. As this is one of those smaller nations, not many know what happened in that country during that war, so this introduction is a useful one to have. 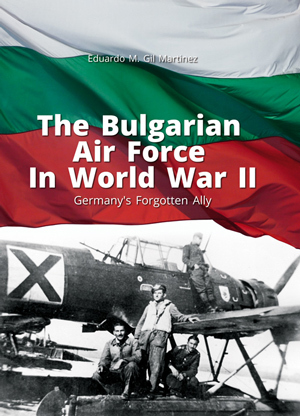 Following that is an overview of the history of the Bulgarian Air Force, from the 1920s through to the end of the Second World War. This section is divided up initially by decade, with sections on the 1920s and the 1930s. Following that, each year gets its own section, from 1939 to 1945.This overview provides a high level overview of what the Bulgarian Air Force was doing during that time period, and broadly what aircraft were being operated. With the basics out of the way, the majority of the rest of the book focuses on the specific units. First up are the fighters, then bomber units, attack units, reconnaissance and liaison, training, maritime surveillance, and transport units. Each of these except for the fighters gets their own chapters. The fighter unit section is its own chapter, but it is further broken down by specific dates, which reflects the fact that there is more readily available information on the fighter units versus the other units. The book finishes up with a short section on aviation insignia, aerial victories, and rank equivalents. The majority of the book is written text, but there are some good photos included. Given the rarity of photos of the Bulgarian Air Force, many of these are very welcome photos, and they cover both the pre-war and WW2 eras. Complementing the photos are over twenty color profile illustrations that highlight the camouflage and markings of the aircraft of the Bulgarian Air Force throughout the years. Combined, the photos and profiles will provide plenty of creative inspiration for the scale modeler. For those interested in small air forces, or common aircraft in uncommon markings, this is a great book to pick up. Aside from the few indigenous aircraft designs, the majority of the subjects here are well-known aircraft such as the Bf 109 or Ju 87, many of which have some fascinating camouflage and marking schemes. My thanks to Casemate for the review copy.